When I posted about Brooklyn here before, I admitted that I might just have been reading it at the wrong time to appreciate it. I found the style so flatly precise it was almost plodding; I thought Eilis herself was so distanced, from herself and from us, that she seemed ultimately insubstantial. “I was expecting something urgent and illuminating to emerge from behind the cool narration,” I concluded, “and was left disappointed.” I liked The Master so much that it seemed to confirm my suspicion that this underwhelmed reaction was at least as much my fault as Tóibín’s, so I decided to give Brooklyn another try. She wished now that she had not married him, not because she did not love him and intend to return to him, but because not telling her mother or her friends made every day she had spent in America a sort of fantasy, something she could not match with the time she was spending at home. It made her feel strangely as if she were two people, one who had battled against two cold winters and many hard days in Brooklyn and fallen in love there, and the other who was her mother’s daughter, the Eilis whom everyone knew, or thought they knew. The answer was that there was no answer, that nothing she could do would be right. . . . She saw all three of them — Tony, Jim, her mother — as figures whom she could only damage, as innocent people surrounded by light and clarity, and circling around them was herself, dark and uncertain. 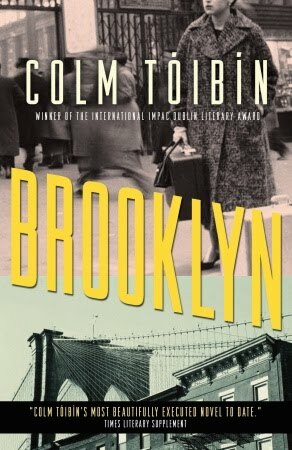 What still bothered me — what still left me discontented — with Brooklyn is that Tóibín’s prose is the antithesis of this uncertainty and of the emotional turmoil Eilis is surely experiencing but that we (or at least I) can’t hear at all in his sentences, which are so calm, so even, so restrained that they leave me chafing against their very simplicity. No matter what she dreamed about, no matter how badly she felt, she had no choice, she knew, but to put it all swiftly out of her mind. She would have to get on with her work if it was during the day and go back to sleep if it was during the night. It would be like covering a table with a tablecloth, or closing curtains on a window; and maybe the need would lessen as time went on . . .
She’s just as muffled before this moment as after it, though, and now that I’ve read The Master I know that this deliberate, cerebral tone is not unique to Brooklyn. Perhaps Tóibín is just drawn to characters who live life below the surface, who experience it, as Eilis thinks of herself, “as though from a distance.” There’s an elegance to this remoteness, and a poignancy that is the careful opposite of sentimentality, but while I admire the emotional delicacy of the presentation more than on my first reading, I’m still left just a bit disappointed. The blurb page of my edition of Brooklyn is full of praise for Toibin’s style. Words like “simplicity” predominate, along with “spare,” “delicate,” and “elegance.” I can imagine a review of Brooklyn that would describe similar features but with less enthusiasm: instead of “spare,” perhaps “sparse”; instead of “delicate,” “flat” or “colorless.” It’s a book that is strangely without affect, so deliberately underwritten it’s as if Toibin was determined to keep not just himself off the page but his characters and readers too. Is elegance dependent on such effacement, such careful subordination of elaboration or enthusiasm? Can there be no pulse, no poetry, in it? The negative review I imagine is not, quite, the review I would write, but I finished the novel feeling still held at a distance. Eilis Lacey, for instance: who is she? What is she like? She’s barely there, though the novel is, I suppose, told from her point of view. Even accepting what I take to be the premise – that she lives remote, somehow, from her own emotions, almost even from her own experiences – she’s an oddly insubstantial figure, the sum of actions she takes and things she says more than any rich conception of character. Like Eilis, the story too is a sequence, this and then this and then this. The writing precise, each detail placed just so, but the pacing is so steady that if I were writing that negative review, I’d call Toibin’s style “pedestrian.” Maybe even “plodding.” I’m not writing that review, though, because I’m not sure that’s so, only that it struck me as so, that I was expecting something urgent and illuminating to emerge from behind the cool narration and was left disappointed. Something can be perfect of its kind and still not be the kind of thing we love: Brooklyn has a certain minimalist perfection, but if I weigh it against, say, Leaving Brooklyn, also a story about self and place, about growing and seeing, about loving and choosing, Leaving Brooklyn is the book for me. (I realize there’s no intrinsic necessity to that comparison, but it occurred to me throughout my reading of Brooklyn.) I’m surprised at my own reaction because I like my books cerebral. Maybe I was in the wrong “head space” myself to appreciate such an austere approach. Have you read Brooklyn? What did you think?